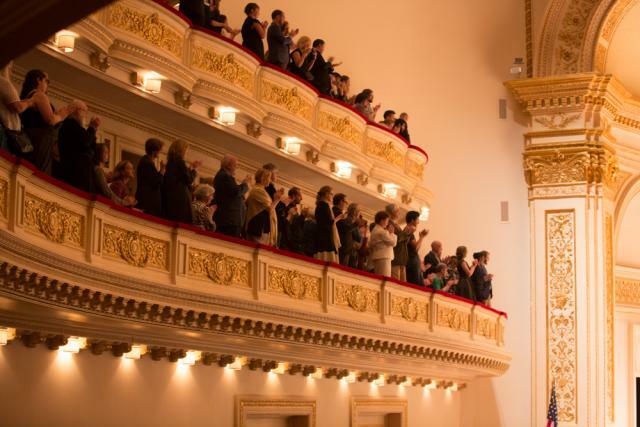 A capacity crowd at Carnegie Hall lauded the music and person of Estonian Orthodox Christian composer at a stunning performance May 31. 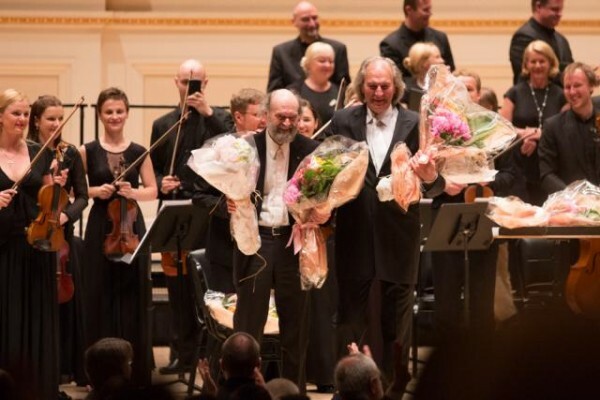 With a sustained standing ovation, a capacity crowd at Isaac Stern Auditorium Carnegie Hall lauded the music and person of Estonian Orthodox Christian composer Arvo Pärt, after a stunning performance of five of his well-known works, Saturday, May 31. The concert was the culmination of three years of planning between the Arvo Pärt Project at St. Vladimir’s Orthodox Theological Seminary, and Maestro Pärt and his wife, Nora, who were present at the concert. The composer was making his first New York appearance since 1984. Executed with breathtaking beauty by the Estonian Philharmonic Chamber Choir and Tallinn Chamber Orchestra were Pärt’s beloved works, “Fratres,” “Cantus in Memory of Benjamin Britten,” “Salve Regina,” and “Te Deum,” with the acclaimed “Adam’s Lament,” which recently was on the Grammy Award winning album of the same name for “Best Choral Performance,” as the centerpiece of the evening. Tõnu Kaljuste, founder of both the choir and orchestra, conducted the performance with exquisite precision and profound feeling. “The Arvo Pärt Project seeks to explore the connections between Orthodox theology, spirituality, and liturgical life and Pärt’s oeuvre—through publications, academic conferences, and through concerts of the highest caliber,” said Dr. Peter Bouteneff, associate professor of Systematic Theology at St. Vladimir’s Seminary and co-director of the Arvo Pärt Project with his faculty colleague, Dr. Nicholas Reeves, assistant professor of Liturgical Music. Maestro Pärt’s characteristic style pays as much attention to pauses and silence as it does to orchestral and choral sound, and his works have been compared to life-changing conversations; his music seems to enclose listeners in a quiet chamber where combinations of sounds, words, and intentional punctuations of silence pose poignant questions to them, begging their participation in thoughtful dialogue. Some of his pieces seem to speak directly to the soul with profound simplicity, like the minimalist “Cantus in Memory of Benjamin Britten,” while other compositions challenge the listener with juxtapositions of silence and unresolved harmonies. His trademark style of tintinnabuli (“little bells”) has a broad appeal, as evidenced by Saturday night’s audience, which included not only high ranking clergy from the Orthodox Christian Church, of which Arvo Pärt is a member, but also actor Keanu Reeves, Icelandic singer-songwriter Björk, and hundreds of admirers from across the U.S. who came to fill the 2,804-seat auditorium. Maestro Pärt received the audience’s accolades following the performance with his typical humility and grace, extending thanks to the conductor, orchestra, and choir, and gesturing in a childlike manner that he was a tad sleepy and that the overwhelming thunder of applause was welcome—but quite enough, after six curtain calls. Following the performance, he and his wife were warmly honored by administrators, trustees, and faculty of the Seminary at a reception hosted by the Estonian government and The Honorable Urve Tiidus, Estonian Minister of Culture. Many other distinguished representatives of the Estonian government, among them, The Consul General of Estonia, Sten Schwede, and Her Excellency Marina Kaljurand, Estonian Ambassador to the United States, also attended the reception. Special awards and presentations to Maestro Pärt at the post-reception included the Seminary’s gift of an icon of its patron, The Holy and Great Prince Vladimir; and a Lifetime Achievement Award from the Estonian American National Council.